The Istituto Storico San Josemaría Escrivá has just published volume 11 (2017) of the journal Studia et Documenta. As usual, the journal is divided into five parts: a monographic study, a studies and notes section, a section dedicated to the publication of documents, there is also a section dealing with recent news and finally there is a bibliographic section. The journal concludes with a section presenting a number of indexes related to the content of the first ten issues of the journal which have been published. The subject chosen for the monographic study which constitutes the first part of the publication focuses on the trips of St. Josemaría Escrivá to Latin America between the years 1974-1975. In the first article of the monographic section, Carmen José Alejos describes the historical and religious situation at that time in Latin America, a period just after the Second Vatican Council characterized by the emergence of movements who challenged, criticized and abandoned the Church thus causing confusion among the members of the faithful. St. Josemaría sought to encourage the members of Opus Dei as well as their friends and relatives. He endeavored to confirm them in the faith, to fill them with hope and to encourage them to remain faithful to the Magisterium of the Church. 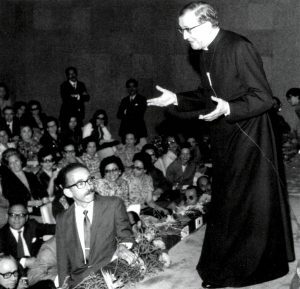 There follows an article by Carlo Pioppi which offers an overview of the trips of St. Josemaría to Latin America, the article includes the trip he made to Mexico in 1970. The two articles that complete the monographic study, written by Alexandre Antosz and María Eugenia Ossandón, examine the trips made by St. Josemaría to Brazil and Chile respectively. These articles also study the meetings the Saint had with members of the Work and other individuals. 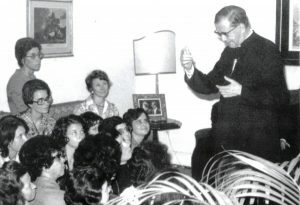 The topics discussed in these meetings give the key purpose for St. Josemaría’s trip: his message was spiritual, not political; he sought to promote unity, not confrontation. In the article by Alexandre Antosz the context of the trip in Brazil is analyzed as well as the subject matter of the colloquia that took place in this country. A festive climate full of expectation and warmth predominated at those meetings. Ossandón’s article provides the reader with a comprehensive overview of the Chilean political situation and the plight of the Catholic Church in that country. Here, Escrivá chose not to hold large gatherings in public places, so that the meetings had a distinctive family atmosphere. The article also tells of his decision to decline an invitation from the Government in order to avoid an erroneous political interpretation of the trip. The Studi e Note section includes two articles which are quite different in content. In the first article, Mercedes Montero analyzes an initiative carried out by the first women in Opus Dei. This was the Minerva publishing house which was set up in the 1940’s. The objective was to foster the reading of good classical and modern books. 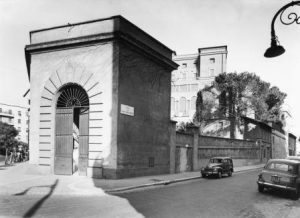 In the second article, Alfredo Méndiz gives an overview of the history and origins of Villa Tevere which is the building where the headquarters of Opus Dei in Rome is located. In the Documentazione section Fernando Crovetto studies the initial steps of Opus Dei in Italy by examining the correspondence between José Orlandis and Salvador Canals in Rome and the members of Opus Dei in Madrid during the years 1942 and 1943. The commencement of the Work in the eternal city is reviewed by studying this correspondence while the influence of the spirit of Opus Dei on the different aspects of personal life (professional, spiritual, etc.) is also reviewed. The Notiziario section gives a brief summary of the Conferences and studies on Opus Dei held in academic circles by members of the Istituto Storico San Josemaría Escrivá such as the launch of the book published by J. L. González Gullón about the DYA Academy. In the Sezione Bibliografica the reader finds an extensive bibliographical note put together by Josep-Ignasi Saranyana about the biography of Raimon Panikkar published in 2013 by the Polish scholar Maciej Bielawski. Then two book reviews are presented: the first review, completed by María Eugenia Ossandón, is about Pilar Río’s book on The lay faithful, the Church at the heart of the world. A theological reflection on the ecclesial identity of the laity in a time of new evangelization, published by Palabra, Madrid 2015. The second review has been prepared by Santiago Martínez Sánchez about Jesus Sevilla Lozano’s book Miguel Fisac. Architect of God or the “Devil”, published by New Utopia publishing house, Madrid 2014. This section also contains 14 bibliographical notes and a list of the general bibliography related to St. Josemaría published between the 2010 and 2013. This list was prepared by prepared by J. M. Fernández and S. Martínez. The final section in the volume offers a series of indexes based on the first ten published issues of Studia et Documenta. There are six indexes in total: a complete index of all the published issues of the journal; an index of authors and their respective articles that have appeared in the journal; historical documents published and analyzed in the section Documenti in chronological order; an index of the names of the people cited in the journal, an index of the books reviewed and finally an index of the bibliographic notes offered.